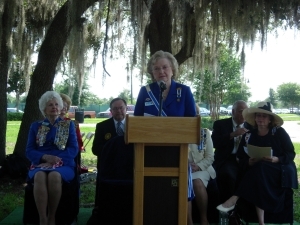 Florida State Regent, Mrs. Barbara Whalin Makant (2009-2011), delivering remarks at the June 2010 dedication ceremony. On March 13, 2008, the chapter honored the original thirteen chapter members with a grave site marker. The beautiful site is located at Greenwood Cemetery in Orlando. The marker is on the Historic Greenwood Cemetery evening tour every week. 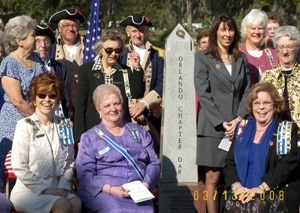 On February 11, 1992, under the leadership of Orlando Chapter Regent Katherine Shuman, three brass plaques were placed in an area known as “Guardians of Freedom” at Constitution Green Park, Orlando, Florida. These plaques were to honor Orlando Chapter’s Organizing Regent Carrie Schuller. Present at the February 1992 dedication ceremony were, from left to right: Lucy Dorcy, Gloria Holly, Mae Stewart (Chapter Regent 1950-1952, Florida State Regent 1958-1960, and NSDAR Corresponding Secretary General 1965-1968), Mrs. T. G. Bess Lee, Elizabeth Williams and Katherine Shuman. On November 11, 1924, a flag pole and granite marker were placed on the grounds of Memorial High School to commemorate the soldiers of Orange County who fought in World War I. 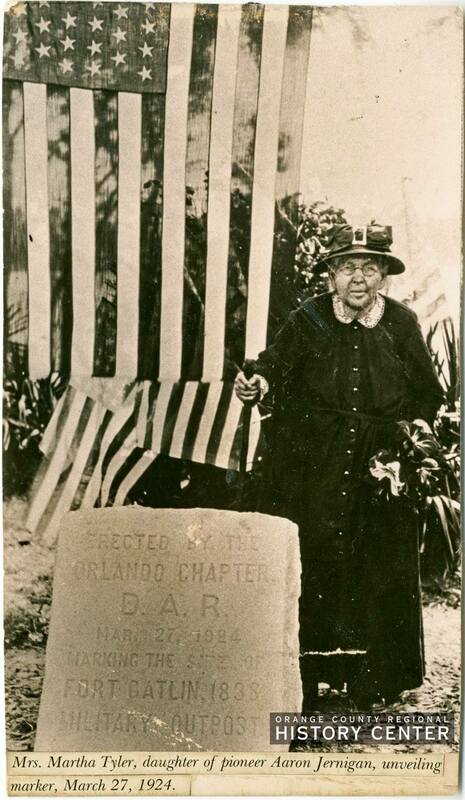 Built with the aid of patriotic citizens of Orange County, the marker is now located on the east side of Lake Eola. 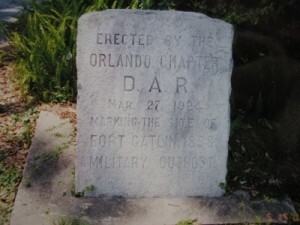 On March 15, 1935, a large granite rock with a bronze plaque and a roadside marker both marked the site of Fort Maitland, built in 1838, by Lt. Col. Alexander G. W. Fanning, on the military road connecting Fort Mellon of Sanford with Fort Gatlin of Orlando. This fort was used as a stockade in the Seminole Indian Wars. The fort was named for the Seminole War Hero, Captain William Seton Maitland, a native of New York and graduate of West Point, whom President Andrew Jackson commissioned Brevet Captain for gallantry and “good conduct” at Withlacoochee December 31, 1865. 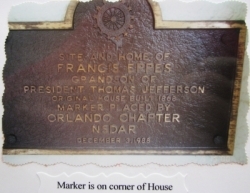 A new marker was placed a few feet from the original location in 1972, to replace the original which was lost. In 1935, a stone of Florida travertine was donated and dedicated by the Orlando Chapter in the “Walk of Fame” at Rollins College to honor Miss Lucy A. 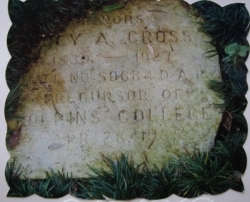 Cross, a precursor of the college, on its 50th Anniversary Celebration. Miss Cross was a member of the Daytona DAR chapter. 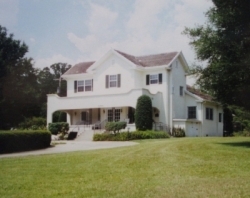 On June 16, 1951 in Christmas, Florida (located twenty-two miles east of Orlando and fourteen miles west of Indian River City on Highway 50) a historical marker was placed to commemorate Fort Christmas. This fort had been established in 1835 and was in a siege of war on Christmas Day. The fort was destroyed by fire many years ago, hence all that is left of this historic site are live oaks and a growth of palmetto. 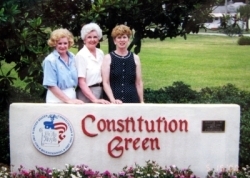 In March of 1992, a brass plaque was dedicated at three magnolia trees that were planted at Constitution Green Park, Orlando, Florida. 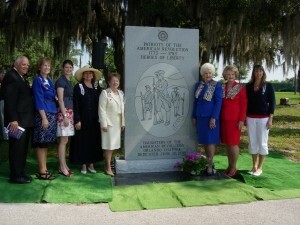 The plaque honored chapter founder Carrie Schuller and honor roll members, Mrs. Thomas Lee and Mrs. Jackson E. Stewart. Pictured from left to right, are Joyce Parker, Edna Benson and Barbara Lemay.